What is Rapid Prototype Service? PCB FAB EXPRESS offers Instant Quoting and Ordering of PCB Fabrication (and Assembly, if needed) for a wide variety of boards. Options for many materials, finishes, overall thickness etc. available. Why risk your IP and deal with customer service headaches with offshore services? PCB FAB EXPRESS fabricates and assembles boards in USA-but at very competitive prices! With our Rapid Prototype Service (RPS) you get the ultimate in convenience for PCB Fabrication. If you also choose Assembly, you get the best value bundled pricing. If you want to mark items as do not populate / do not install, just have a column titled Do Not Install and for those items put "DNI" as the value. See a sample BOM here for details. Our Rapid Prototype service enables ultimate speed and convenience for your PCB FAB ONLY or your PCB FAB+ASSEMBLY needs. PCB Fabrication: Instantly quote and order standard technology, rigid PCBs up to 8 layers, with standard materials and finishes. These are single lamination PCBs (i.e., no blind/ buried vias allowed). PCB Fabrication will be done to IPC-6012 Class 2 specification. PCB Assembly (OPTIONAL): Instantly quote and order Consigned, Turnkey and Partial-Turnkey assembly though the RPS. (Get instant BOM pricing also!). Assembly of Rigid PCBs only, not flex or rigid-flex! PCB Assembly will be done to IPC-A-610 Class 2 specification. For PCBs: We prefer 274X Extended Gerber format. If your file is not in 274X, send an Aperture file. Please see FAQ below for what files to include. For Assembly: You will need to upload your BOM (excel format) online for quoting. In the final package we will need Assembly Drawing and XY data also. 1,2,3,4,5 and 10 business days from order date. When will my boards ship if I order today? From 1 PCB to 1500 PCBs. Some restrictions may apply for large quantities on Quick Turns. Maximum X or Y dimension allowed is 15.9" and minimum dimension allowed is 0.5"
FR4, FR4-06, Polyimide, FR4-Lead Free Standard materials are instantly quoted online. Exotic materials may be quoted by a Customer Service Agent offline. Please note that RPS is for Rigid PCBs only. For Flex or Rigid-flex PCBs, please get a custom quote directly through a PCBFabExpress sales person. The tolerance for thickness in RPS is +/- 10% of nominal thickness for boards down to 0.031 thick For boards less than 0.031 thick the Thickness Tolerance is constant at +/- 0.003 (+/- 3 mils). Arrays are allowed in RPS product. But we will NOT create the arrays for you- your file has to have the array as a single-up image! When quoting, you will have to enter the Array dimensions, how many boards per array, and Individual board dimensions. For PCB quotes purpose always enter the quantity of individual boards (NOT the quantity of arrays). Arrays may have Scoring or Route and Retain. Down to 4 mils (0.004") minimum trace/space! Inner layer copper: 0.5 oz, 1 oz, 2oz, or 3 oz. Outer layer (finished) copper: 1 oz, 2 oz, 3 oz, or 4 oz. HASL(Solder), Lead-Free HASL, Hard Gold, Bondable Gold, Immersion Gold, Immersion Silver. Down to 6 mils (0.006") finished hole size allowed. Plated holes: 246 mils (.246"). Non-plated holes: 199 mils (0.199"). Instant quote may not be available if hole density exceeds 100 holes/sq inch (Total holes on a board/Area of board) Our Customer Service Agent may ask for more details before quoting designs with such high hole-density. We allow via-in-pad features on your board. The turn time for such jobs will be minimum 7 days (for Turnkey). All vias in such boards will be filled with non-conductive filling. For more details on Annular Ring requirements click here. In our RPS offering, we don't allow you to specify dielectric thicknesses. However, you can get controlled impedance features using our standard stackups. This means in your design, you are specifying the width of certain traces and spacing to achieve a specific resistance. In your impedance modeling, use the Dk for material 370HR. We expect that in your fab drawing, you will have a Impedance table that CLEARLY identifies the Target Impedance(s), the Layer(s) on which they exist and the specific Trace Widths / Spaces to be controlled. See a sample format for Impedance Table. Our engineers will meet your controlled impedance requirements using our own stackup. If your Controlled Impedance requirements exceed this spec, please ask for a Custom Quote. Solder Mask is available in following colors: Green, Blue, Red, Black, White and Clear. It is allowed on both sides. In our Web PCB service, we only offer LPI solder mask. Please follow the guidelines given below. We only offer LPI solder mask in our Web PCB service. If your design forces us to use Laser Direct Imaging LPI (LDI-LPI) solder mask, we will contact you and get approval for a $500 extra charge on your order. Legend Colors available: White, Black, Yellow. Both sides allowed. (Legend should have minimum 5 mils (0.005") trace width). UL Markings: We will put UL marking for any FR4 material jobs ordered through RPS. The PCBFABEXPRESS logo is generally applied on all PCBs and it is on silkscreen/legend. If your PCBs do not have silkscreen/legend, then the PCBFABEXPRESS logo may be put in copper. FedEx, UPS, Will Call. You can use your own Fedex/UPS Account number. International Shipments allowed. All duties/customs are responsibility of the customer. See shipping charges here. For 4 Layer or more orders, please include stack-up information. Please be available to clarify any discrepancies by providing your 24 hour contact number. IMPORTANT NOTE: RPS are manufactured to IPC-6012 Class 2 specifications. (RPS are not appropriate for Mil-spec or Class 3 jobs-- please get a custom quote for those). Also, if your design has ITAR considerations, do mark the ITAR radio-button when getting quote. For PCBs, special features like Milling, Blind/Buried vias, Mixed Copper layers, etc., cannot be instantly priced online. However, please use the online price matrix anyway and press the CLICK HERE link. A Customer Service Agent will contact you and get you a quote as needed. For Assembly, our online labor quote is for RIGID boards only with below specifications. Minimum passive component size allowed is 0201. Minimum pitch allowed is 0.4 mm for regular SMT devices (For BGA the minimum pitch allowed is 0.5 mm). Maximum number of thru hole components (per board) is 20. Minimum component pad size must be 8 mil X 8 mil or 8 mil diameter. If any of these is required, such services will be quoted separately by a Customer Service Agent. PCB FAB EXPRESS reserves the right to refuse any RPS order within 1 business day. This rarely ever happens, but may happen, say, if your board design or assembly has special complexities that are not commensurate with the price paid online. LPI solder mask process requires 4 mil web & 1.5mil solder mask clearance. LPI solder mask process requires 5 mil web & 1.5mil solder mask clearance. 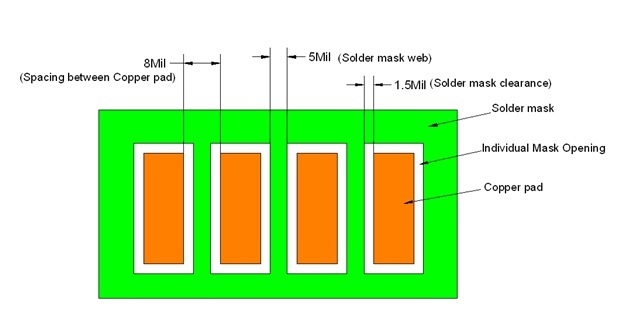 LDI-LPI solder mask process requires min 4mil web. Solder mask clearance can be less than 1.5mil. Copper pad size & Solder mask opening is One to One (cu pad & solder mask opening are same size). 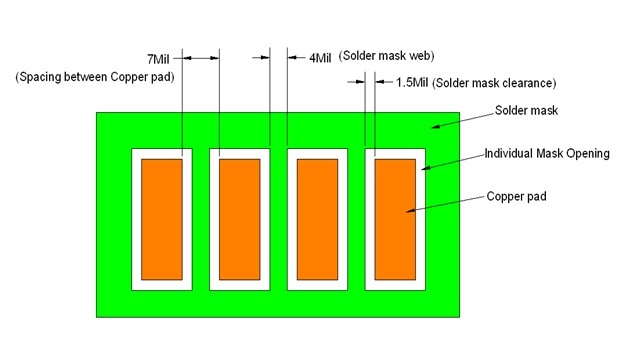 LDI-LPI Solder Mask process require min 5 mil web. Solder Mask clearance is less than 1.5 mil. Copper Pad size & Solder Mask opening is 1:1 (i.e., Copper Pad & Solder Mask opening are same size).